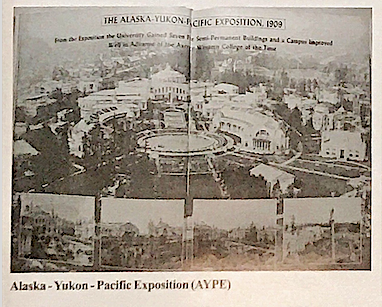 A picnic was held near the AYPE site and over 300 people attended. 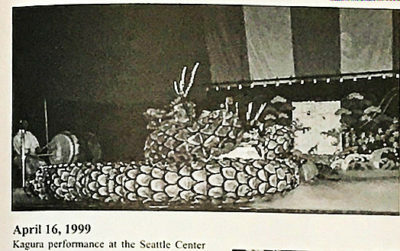 To commemorate the 20 years history of The Pacific Northwest, Hiroshima Ken Jin Kai published a book. 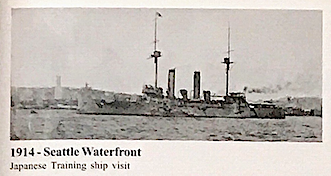 For the period of 1921 to 1945 written information and photographs are almost non-existent because records were either lost of destroyed during the World War II. From 1941 to 1945 club activities were suspended because members were incarcerated in various internment camps. 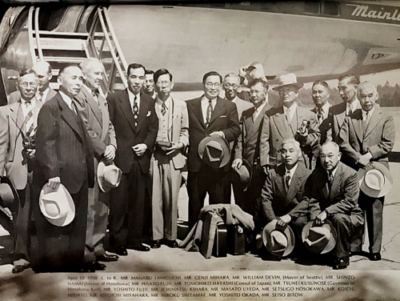 When World War II between Japan and America was declared all of Hiroshima Ken Jin Kai Board members were arrested and detained in the United States Immigration Station. At the same time all club activities ceased. 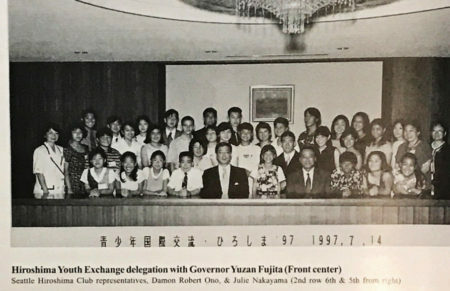 Some of the former leaders gathered at NP Hotel and made a plan to revive the organization under the name of Gei BI Club, following the same purpose and rules they had before. 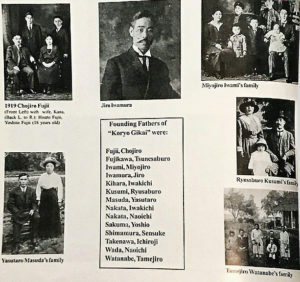 After enduring a very diffivult period during and after WWII, former Ken Jin Kai members re-established the organization which they named the “Gei Bi Club”. with the same mission, purpose and rules as they had before. In 1984, the name was changed back to “Hiroshima Ken Jin Kai” as some had felt that the name “Gei Bi Club” gave a feudalisitic impression and the possibility for being misunderstood by future generations. The first post-war meeting was held at Maneki Restaurant attended by 34 members, and the club was renamed the Hiroshima Ken Jin Kai. 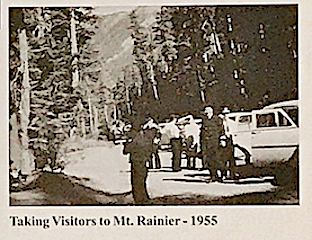 As the Club’s members re-establishe their lives in the greater Seattle area after WWII. Hiroshima Ken Jin Kai’s activities expanded to support others, by sending care packages and financial aid to wartorn Hiroshima. 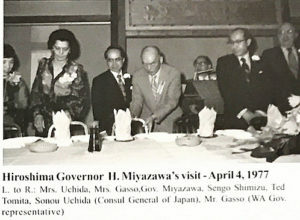 The Governor of Hiroshima Tsunei Kusunose as well as the Mayor of Hiroshima Shinzo Hamai made a seattle visit. 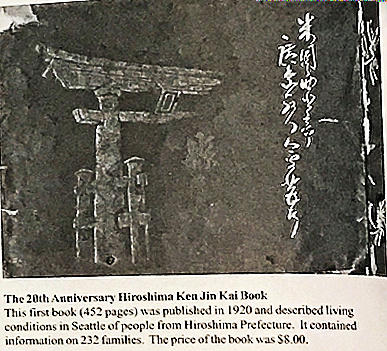 The Hiroshima Ken Jin Kai raised $400 through the sales of Peace Seals for the Hiroshima Reconstruction Fund. As a response to a request from mayor of Hiroshima, Shinzo Hamai a fund-raising effort was held for the constructions of a children’s library. 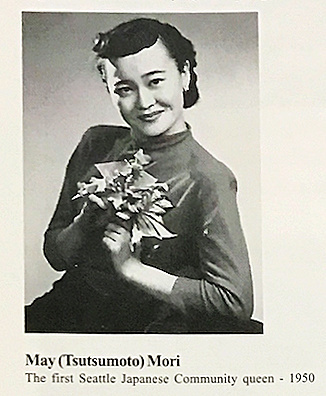 It started on May 1950, May (Tsutsumoto) Mori, was chosen by Seattle JACL to represent our city in the National JACL Convention and to participate in the National Queen Pagent in Chicago. 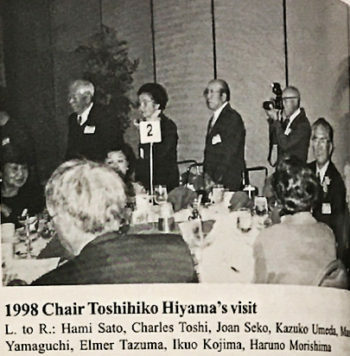 She was the daugther of Club members Mr. and Mrs. Tsutsumoto. 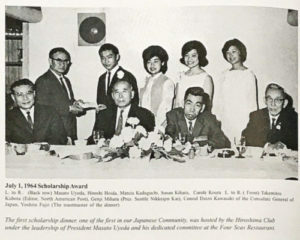 Ten years later in 1960 Japanese Community Queen program began with a vision of Minoru Tsubota, who proposed a Nisei Queen Pageant be organized. 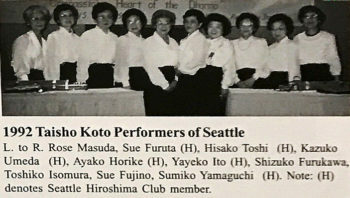 Many daughters of Seattle Hiroshima Club members have been selected as the Seattle Japanese Community Queen since the inception of the program. The name of Hiroshima Ken Jin Kai was changed to Hiroshima Club. The constitution of the club was revisedand at the same time the new Miyajima Club was organized and started by the younger members. In an effort to aid members in fullfiling the hope and dreams of higher education for their childres, Hiroshima Club established a college scholarship program. The scholarships recognized outstanding highschool seniors. The first awards were given to four Hiroshima descendants, Hiroshi Hoida, Marcias Kadoguchi, Susan Kihara and Carole Kouara. Since that time more than 130 students have been the recipients of the Hiroshima Club scholarships. At the annual picnic 125 members of the club took three busses to Ocean Shores for a day trip. In conjunction with the 25th anniversary of the bombing of Hiroshima. 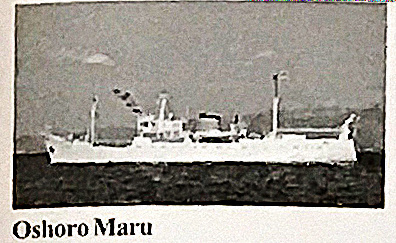 Masato Uyeda led a group to Hiroshima Japan. 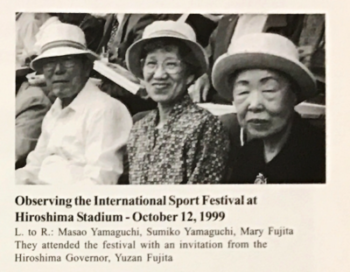 Mr. Masato Uyeda led a group of members to attend Hiroshima’s 25th Atomic Bomb Anniversary in Hiroshima City, Japan to present flowers from the Seattle Hiroshima Club. The name of the club was changed to Seattle Hiroshima Club, when it became registered as a non-profit organization. This is the name which the club is known today. 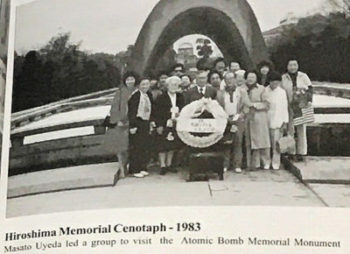 In the midst of the camaraderie and good times enjoyed by the group, Hiroshima Club members also remembered the past losses and suffering of their families. The 30th Anniversary of Atomic Bomb Memorial Service was held at the Seattle Buddhist Church attended by 250 people. This was the beginning of the combined Seattle Hiroshima Club and Seattle Buddhist Church annual atomic bomb memorial services. 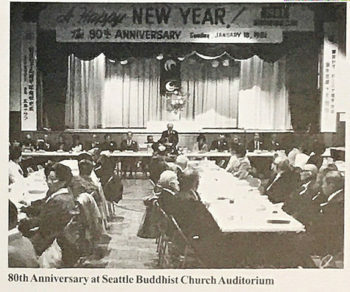 The Club’s 75th anniverssary celebration was held in Seattle Buddhist Church auditorium. The Club reach a milestone and celebrated its 75th Anniversary with over 350 people attending. 19 members 85 years and older were sent congratulatory letters and gifts from Hiroshima Governor Hiroshi Miyazawa and special achievement awards were presented to seven members. Total membership has reached 507 at this point. Gov. Miyazawa of Hiroshima Prefecture visited and a doctor from Hiroshima visited Seattle for kenshin. Kenshin is a physical examination of atomic bomb survivors from WWII. This visit signals the bi-annual visits by a doctor from Hiroshima to the present time. Hiroshima Club celebrates the 80th year anniversary at Settle Buddhist Church Auditorium. An outing to Harrison Hot Springs Canada was held for members. A 14 day tour of Japan was organized by Yoshiaki Sako, Ted and Paul Tomita. 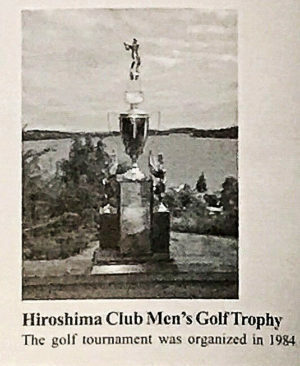 A new type of Activity was initiated when the first Seattle Hiroshima Club Golf Tournament was introduced on 1984. It was played at the Jefferson Park Golf COurse and was won by Smith Morimoto. The 85th anniversary of the club was celebrated. The Mayor of Hiroshima , Takeshi Araki visited Seattle. A representative of the Hiroshima Museum visited Seattle to interview members and collect materials for the museum. 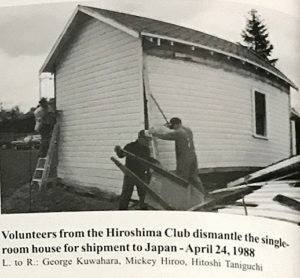 As it had done in the past, the Club responded whole-heartedly to request from Japan, members collected and shipped three containers of materials including a farm worker’s shack, horse driven farm equipments, oyster harvesting equipment, office machines and books about Japanese immigrants in the Northwest. The Frank M. Kobuki House a quintessential shelter for farm workers in the early part of this century was dismantled and sent along with its furnishings. The Club continued with social welfare work and visited 24 members in Seattle Kiro Nursing Home and 13 shut-ins in their home. Starting 1992 the Club began visiting Keiro residents twice a year with gifts of poinsettias during their December visits. Governor Takeshita of the Hiroshima Prefecture visited Seattle. A ten-day tour of Japan was organized by Tsu Horike. A group of musicians from Hiroshima performed Taiso Koto at the Seattle Buddhist Church Auditorium. 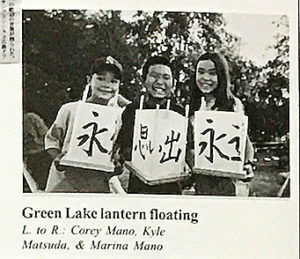 The Club Started yearly donations to “From Hiroshima to Hope” lantern floating ceremony program in remembrance of the atomic bomb victims of Hiroshima and Nagasaki. Two descendants of Hiroshima Club mebers, Julie Nakayama and Damon Ono attended a Youth Exchange Program in Hiroshima, Japan. 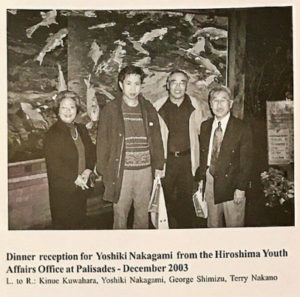 The main purposes of this project were first to promote international understanding and encourage communication and personal exchanges between foreign youht ans the youth of Hiroshima and second to promote new networks for the next genera tion. 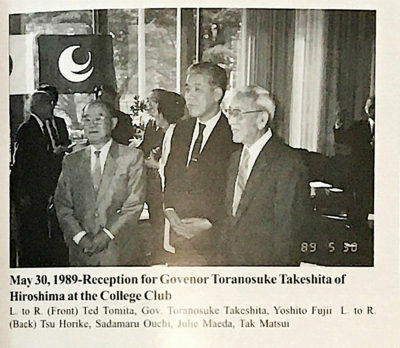 The men’s Golf Tournament became so popular that they invited the female members of Hiroshima Club were invited to participate. Nori Yamaguchi was the first winner in the Women’s Division. 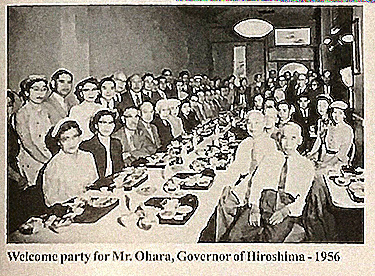 Approximately 100 members including those from Oregon Hiroshima Club attended dinner to celebrate the reception for Chairman Toshihiro Hiyama and nine delegates of the Hiroshima Prefectural Assembly. Mr. Hiyama presented and award to 19 members attending the dinner out of 82 current members who are 80 years and older. And a special appreciation award to Tsu Horike, Masao Yamaguchi, and Paul Hosoda for their many years of service to the Club. 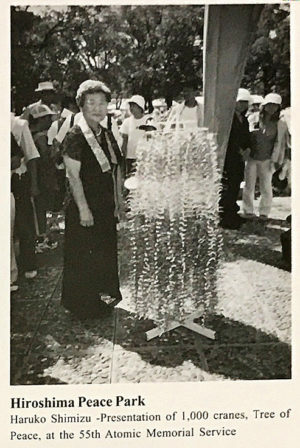 Haruko Shimizu, a talented teacher of the ancient craft of mizuhiki, crafted and presented the “Tree of Peace” to the Hiroshima Peace Park. This work of art consisted of 1,000 mizuhiki cranes in various colors as a sumbol of peace. Mrs. Shimizu was assisted by Hiroshima Club, Seattle Betsuin women, and Dharma class students in this project. The club gave $250 for Mukilteo Historic marker, recognizing good will between Caucasian and Japanese workers in the lumber industry in early 1900’s. A dinner reception was held in honor of Mr. Yoshiki Nakagami who is the supervisor of the Youth Affairs Office, Environmental & Citizens Affair Department of the Hiroshima Prefectural Government. The Club assisted Mr. Nakagami during his three day visit to Seattle to contact educators at International Innovations and Seattle University to learn and hear the programs being conducted to promote youht developments in the USA. The Youth Affairs Office is searching from new methods in which can be incorporated into their programs to promote involvement from families, schools and local communities and to invigorate youth developments activities in their local communities. Two students from the Club attended the Hiroshima Youth Exchange Program in Hiroshima Prefecture in Japan.